The Pumpkin King is at It Again! 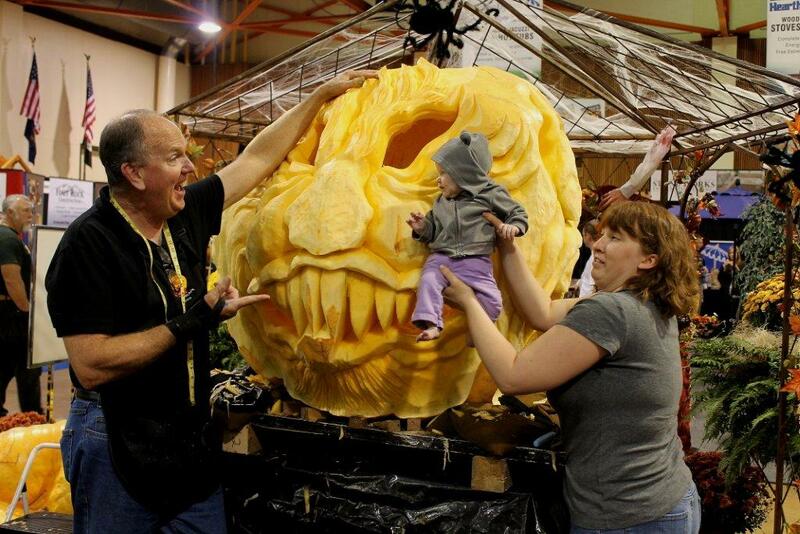 Fall Creek’s very own Scott Cully, pumpkin-sculptor extraordinaire, will be carving it up in the Pumpkin Palooza!, at this weekend’s Lane County Home Improvement Show (October 7-9). Cully specializes in carving gourds of truly epic proportions. Below is a photo of one he carved for a previous year's show being admired by a young fan. With seminars, exhibits, and prizes it’s sure to be a great show. Cully with one of his youngest fans at the Eugene Home Show 2012. He holds the official Guinness World Record from 2010 for carving the largest jack o' lantern (photo). He's been carving for years--since he and his wife had a farm in West Connecticut that grew 200-300 pound pumpkins on 20 acres, and sold them to chain stores west of the Mississippi River. In 1988 he carved his first massive pumpkin for a friend's party. The pumpkin weighed a mere 400 pounds. 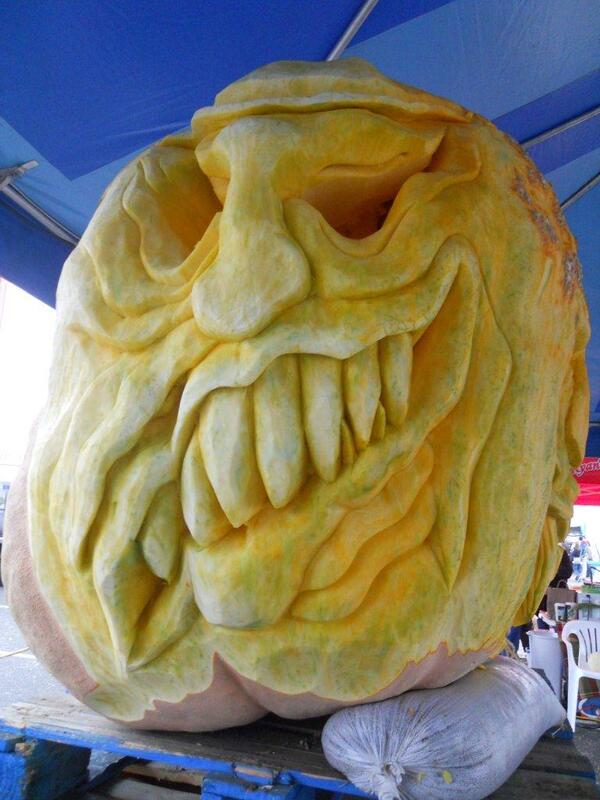 The largest pumpkin he has carved (in 2010) weighed more than 4 times as much! 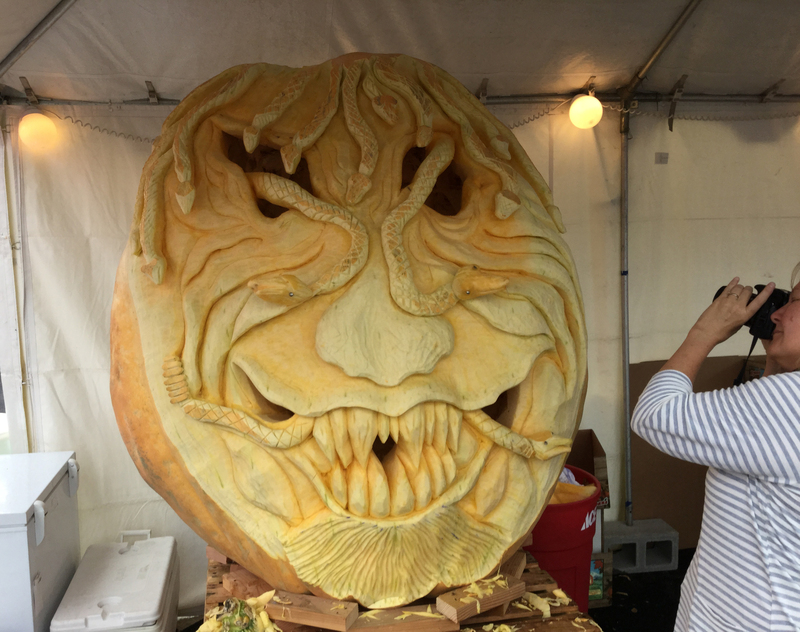 The ghoulish behemoth completed at theHood River Harvest Festival 2015, weighing a whopping 1,430 pounds (650kg)! USMC logo design for the Foxwoods Resort Casino, 2006. A towering totem of jeers.